Now that I clarified that for you, I have another confession to make. Like many other people, I love comedy and I love to laugh. I love to make other people laugh too. I regularly listen to comedy podcasts, enjoy watching sitcoms, stand-up specials, comedy round-tables, and secretly watch silly comedy films. I consume a great deal of comedy, and my favorite comics are smart men and women who do more than make me laugh, they also make me think about the larger issues they address in their comedy. Louis C.K., Alan Carr, Eddie Izzard, Tig Notaro, Chris Rock, Jerry Seinfeld, Wanda Sykes, Sarah Silverman, Margaret Cho, Craig Ferguson, Julian Clary, Key and Peele, Isy Suttie, Todd Glass, Alec Mapa, Marc Maron, and Judy Gold, are comedians that I think are at the top of their game. I could add ten to fifteen more comedians to that list, but I’m not writing about them, and I will save that for another day. In this 3 minute clip, Cameron Esposito kills it. She’s cute, she’s funny, she’s smart, she’s articulate, and she does indeed annihilate a homophobic straight male heckler. He yelled that at me like as if I don’t know. He yelled that at me like it was going to be a surprise, and an insult. Here’s the thing: I look like a woman who doesn’t sleep with men because I am a lesbian… and that’s one of the biggest parts. This look, this is on purpose. To attract women. If you don’t know about Cameron Esposito, search for some of her sets on Youtube. Her network television debut was on the Late Late Show with Craig Ferguson, about a year ago, and she was beyond brilliant. Cameron grew up in a Chicago suburb, attended parochial schools, and graduated from Boston College. She writes a great bimonthly column for A.V. Club that’s entitled “Who In The World Is Cameron Esposito,” hosts the Put Your Hands Together podcast, and she’s engaged to be married to a fellow comic. 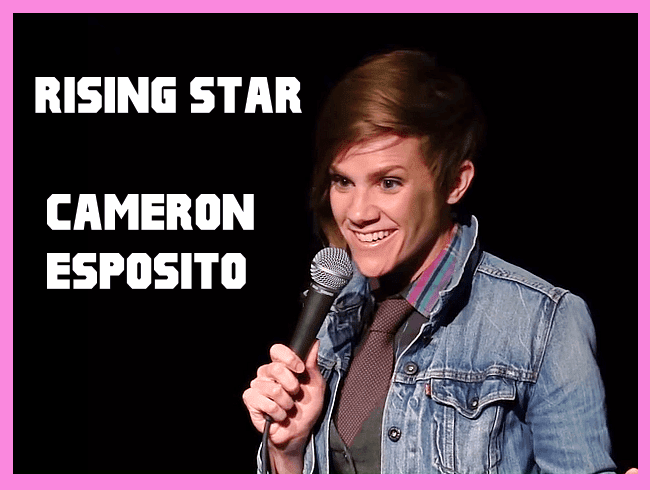 You can also find her on Twitter at @cameronesposito . Pay attention to this kid, because she’s going places. And if you haven’t watched the video embedded above yet, watch it now, as I have to admit that I’m glad I watched it myself (and over 230,000 others have watched the video too). I have a hunch that this smart and funny lesbian is going to join the ranks of those comedians I listed up above. This kid is going to be a star.